Plans to rebuild Russell Street from West Broadway to Dakota continue to move forward, bringing one of Missoula’s largest transportation projects closer to construction. Loran Frazier, the project manager with the WGM Group, told the Transportation Technical Advisory Committee on Thursday that the $25 million project will go to bid this year. Frazier said the Montana Department of Transportation is working with appraisers to acquire the right of way needed to accommodate a wider roadway. Negotiations with adjacent property owners continue, though utility work should begin this summer. In recent years, the Russell Street corridor began its slow transformation toward urbanization. The trend began in 2012 when Farran Realty Partners launched the construction of a 224-unit apartment community west of Russell. Last year, the Salvation Army completed its new building, just as crews finished the reconstruction of South Third Street West. The area’s redevelopment is expected to accelerate once the Russell project comes online. 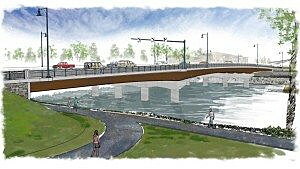 Now years in the making, plans includes five lanes of traffic and a new bridge with arched girders over the Clark Fork River. The street itself will include a landscaped boulevard and decorative lighting similar to what was recently installed on Wyoming Street. The Milwaukee Trail will cross underneath the roadway, as will a trail extension along the river. Frazier said several changes to the project, including the need to modify a levee along the Clark Fork River, have added to the overall cost. Recently, he said, several homes south of the project have come on the market. Frazier said the funds were authorized to purchase the homes and acquire the right of way needed for future phases of the project as it eventually progresses south of Third Street. At roughly $25 million, the project’s first phase has emerged as one of the city’s largest transportation jobs in recent memory. It’s expected to take two years to complete once construction begins in 2017.